In late March, we reported that pressure was building within the Hamas-run Gaza Strip, which could lead to a new round of fighting with Israel. In recent days, violence out of Gaza has indeed escalated significantly, and the trigger has been a succession of breakthroughs in the Israel Defense Forces' (IDF) ability to detect cross-border assault tunnels that threaten Israel's south. On Thursday morning, the IDF announced that it had found a tunnel 30 meters (98 feet) underground that reached into southern Israel, not far from where the IDF used new breakthrough technology to locate another tunnel in April. Realizing it is about to lose its most prized offensive weapon against Israel – the ability to inject murder squads in Israeli territory though tunnels – Hamas's military wing decided to do something it has not done in almost two years. It began a succession of cross-border mortar attacks in the vicinity, with a view to disrupting the detection work, and more importantly, to signal to Israel that Hamas is willing to risk war over its tunnel program. Hamas's attacks began on Tuesday with small arms fire and a mortar attack on IDF unit near southern Gaza carrying out engineering tunnel detection work. It escalated on Wednesday, as units came closer to locating the tunnel, resulting in multiple mortar attacks, and Israeli retaliatory tank and air strikes. By Thursday morning, the IDF located its latest tunnel, sending home the message to Hamas's military wing that the days in which it could dig subterranean structures under the border into Israel are drawing to a close. Hamas persisted in mortar attacks, which at this stage appear to be missing Israeli forces deliberately, sparking yet more tank and Air Force replies by Israel. "We view this technological, intelligence, and operational effort as a success. 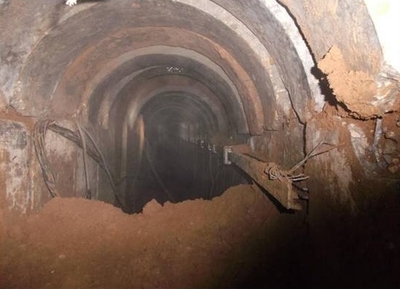 We can say that this tunnel is a violation of our sovereignty," a senior IDF source said on Thursday. According to the source, Hamas's attempts to tell Israel to stop destroying its tunnel program are in vain. "We are determined to continue with these efforts, and understand that we must focus in these areas," he added. Looking ahead, two principal scenarios could unfold in the coming days and weeks. The first possibility is that Hamas's military wing does not back down from its so-called red line, and continues to back up its call for Israel to cease tunnel-detection work with cross-border fire. In such a scenario, Israel would be hard-pressed to contain a resumption of the reality that existed in the south prior to the 2014 conflict with Hamas. A resulting security escalation would rapidly grow in scope, and the IDF would quickly have to implement plans to destroy the military wing's offensive capabilities. This development would result in a major new conflict, which could end with only Hamas's political wing remaining intact, as well as the Islamist regime's domestic police force. Unlike previous rounds of fighting, Israel this time may be determined to destroy Hamas's 20,000-strong military wing, including the 5,000-member Nuhba elite force (which is trained to cross into Israel via the tunnels). In essence, Hamas needs to choose between backing down from its stance on Israel's tunnel detection, and watching its trump card blow away, or risk the existence of its military wing. Should it choose the latter, it would comply with the wishes of Hamas's political wing, which is less eager to provoke a military confrontation with Israel so soon after the 2014 war. "Operation Protective Edge" was the most intensive conflict ever experienced by Hamas. The two-month war left a deep imprint on Hamas. It challenged Hamas to a far greater extent than any previous military clash with Israel since Hamas seized power in Gaza in 2007. It was exposed to the most sustained and accurate Israeli firepower in its history, and lost more of its operatives in battle than any previous time (although it had also never achieved this level of capabilities before 2014). Hamas is still in the midst of rebuilding its rocket arsenals, rebuilding tunnels, and constructing drones, as well as assembling a naval terrorist intrusion unit. Gaza's long suffering civilian population, under the grip of its Islamist jihadist rulers, may not wish to stomach a new war so soon. The fact that, until now, Hamas has not fired a single projectile or bullet at Israel indicates that it understood that Israel is not prepared to seek containment as a response to ongoing cross-border fire. These factors could be enough to deter Hamas from continuing to escalate the situation further. The coming days will reveal what Hamas chooses. None of its options are attractive. Ultimately, its choice is between fighting for its tunnels, and risking its existence as an Islamist fighting force, complete with brigades, battalions, and command and control capabilities, thousands of rockets, and many thousands of anti-tank missiles and RPGs, or backing down.